It’s a feeling that most musicians can relate to, but there’s a certain intensity to the way the Australian percussionist, composer and producer expresses it that reveals something very special in the way Holy Spring was created. Multiple threads running through a life of improvisation have recently converged in Pike’s artistic process, leading to working methods where he is endlessly surprised by the sounds he produces. The excitement is imbued throughout; it is written into the fabric of every sound. 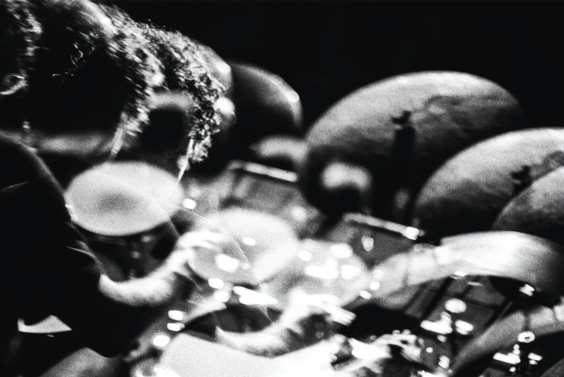 Improvisation has always played a role throughout Pike’s long and diverse career in music. Whether as part of PVT, Triosk or Szun Waves, or collaborating with Liars, legendary jazz pianist Mike Nock, DD Dumbo or the mighty Bill Callahan, he has long been a responsive musician for whom sensitive listening leads to spontaneous invention. Every motion, from the most minuscule flicker to a primal groove, is an expression of what’s happening around him. Which is precisely how he, and the ensembles he’s been part of, have been able to navigate so deftly between the poles of the familiar. Pike’s work has always skirted around electronica, spiritual jazz, post-rock and many other recognisable sounds, without ever converging on one single style or resorting to obvious fusions. This was crystallised on Distant Early Warning, his 2018 solo album, for which tracks were recorded entirely live, with Pike playing both drums and sampler. This time around, confident in the success if what he calls a “conceptual experiment,” he’s concentrated that process further, developing and assembling samples (“pieces of a puzzle,” as he puts it) in a single month and recording Holy Spring live in one day. Thematically inspired by the pagan fertility myths of Stravinsky’s Rite Of Spring, Pike has established a rigorous compositional method that lays the groundwork for spontaneity: he arranges his puzzle pieces carefully, knowing that the music he wanted to hear would emerge, regardless of how they assembled themselves in the moment. Laurence Pike studied at Sydney’s Conservatorium of Music, under Australian jazz legend Mike Nock. An ongoing relationship has produced two critically acclaimed duo albums - Kindred (2012) and Beginning and End of Knowing (2015), the latter of which earning him a Bell Jazz award for 'Best Producer'. Equally at home in the worlds of rock, electronica, jazz and improvised music, he continues to work with his internationally acclaimed electronic group PVT which has performed with the likes of Sigur Rós, Arctic Monkeys, Warpaint and Yellow Magic Orchestra. 2018 saw the release of Szun Waves’ acclaimed sophomore album, New Hymn To Freedom, in collaboration with Luke Abbott on modular synthesiser and Portico Quartet’s Jack Wyllie on saxophone. Pike has performed with the Sydney Symphony Orchestra and in 2017 premiered his work for drums, electronics and dance with Bangarra Dance Theatre's Waangenga Blanco as part of the Supersense Festival in Melbourne. He is a member of Jack Ladder & The Dreamlanders, and tours and records with Liars, award winning Australian singer/songwriter Sarah Blasko, and 4AD recording artist D.D Dumbo. A former member of the seminal electronic/jazz trio Triosk, Pike is widely regarded as one of Australia’s finest musicians.